tattoo vectors. 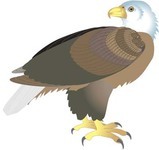 Could also be used as logo elements for sports clubs with names like eagles or mustangs. You can download more vectors like this on Vectorportal.